right to justice and pure food. 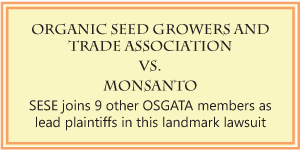 The Organic Consumers Association has started a campaign that could do some good in checking some of the egregious abuses of the public good coming from the GMO industry. They have drafted an open letter to Natural Food Stores and Coops calling upon them to label all food not certified organic or certified non-GMO as possibly containing GMOs and all meats not certified organic or humanely raised as likely coming from a CAFO (confined animal feeding operation, the worst of the factory farms). The lack of adequate labeling of potentially dangerous, or in some cases demonstrably dangerous, GMO ingredients is criminal. GMOs have been proven time and again to carry a set of risks to consumer health, not to mention environmental health, that is not shared by conventionally bred plants and animals. If they are going to be allowed on the market then consumers should at the very least know whether or not they are buying and eating them. While it is estimated that 60% of the food on grocery stores shelves in America contain GMOs only 20% of American consumers believe they have eaten food containing GMOs. An informed citizenry is something we should all be able to get behind, regardless of our feelings about whether GMOs are something we personally want to eat or not. Customer appeals to natural food stores and coops sounds like an easy way to start a market led effort to label GMO foods, raise awareness about their ubiquity in America, and raise awareness of what the certified organic label stands for. A recent New York Times poll suggests that nearly 90% of US consumers want GMO foods labeled. Hopefully the many groups fighting for a regulatory fix find success but in the meantime a little bit of market based pressure from below can only help. For the past dozen years, ever since our cooperative took on stewardship of Southern Exposure Seed Exchange from Dr. Jeff McCormack, we’ve been operating the business out a repurposed living room in our large collective house. “Don’t worry,” we were told, “it’s just temporary. We’ll get the business its own building in a year.” Thanks to all your support and the resulting twelve years of steady and dramatic growth we really can’t put it off any longer. And so we are embarking on the exciting and challenging project of trying to build our dear SESE a brand new home. -A commitment to promoting organic and sustainable agriculture. This world, this soil, this place is our home and we should treat it that way. Better to work with the living systems that sustain us than against them. -A strong cooperative and educational spirit. We’re all in this together and we will all do best collectively if we open up, share, and cooperate. As Ira likes to say, you can get a bigger slice of pie by stealing other people’s slices or you can get a bigger slice of pie by working with the other folks to make the pie you’re sharing bigger. We prefer the latter. -An interest in preserving and promoting our regional cultural heritage. The work of generations in this particular beautiful place we call home has yielded a rich heritage not just of delightful vegetables but also song, art, craft, and architecture. Diversity is real wealth and we should preserve and promote it for all to enjoy. So, here is what we have set out to do. We will build a headquarters for Southern Exposure Seed Exchange that is beautiful and functional and a joy to work in. We will make it out of materials that do not contribute to the spread of toxic substances in our environment. We will make it out of materials and using techniques particularly adapted to Central Virginia. We will draw upon the heritage of historic and regional building trades to make a building anchored in the history of this place. And we will use both the finished building and the process of building it as a way to reach out to our local community to cooperate on shared goals and to serve as an educational and advocacy platform for the techniques and technologies and philosophies that we employ. My name is Paul Blundell. I have been with Southern Exposure Seed Exchange for almost 6 years now and have been heading up the project in its nascent stages. I have some experience in the historic preservation trades and am acting as our networker-in-chief for this project.